You are here: Home » MEDIA » Books » TV Cars: Star Cars From The World Of Television by Giles Chapman (non-fiction review). 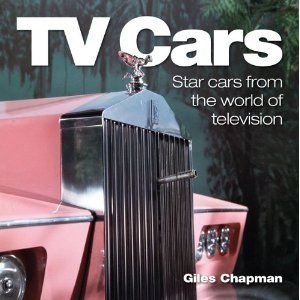 TV Cars: Star Cars From The World Of Television by Giles Chapman (non-fiction review). Just in case you thought that publisher Haynes only did manual-sized books, I came across ‘TV Cars: Star Cars From The World Of Television’ by Giles Chapman. With the front radiator of FAB ONE on the cover, one would think that there would be some fantasy cars under the cover. Of the fifty-two cars, there are twelve entries that relate to our genre. If you ignore ‘The Protectors’, four from the Gerry Anderson stable, although oddly, the ‘Captain Scarlet’ entry although having the puppet figure there has the CGI series car than the original SPV and oddly, not ‘UFO’ with its gull-winged cars. This isn’t to say the other car entries aren’t of interest. If you’ve picked up other media car books I’ve reviewed over the years, they do cover those used outside of our genre as well. Released in 2011, Chapman also covers a lot more of the incidental cars from the UK and certainly a few that I haven’t seen before as well. The best example of that is the 1955-59 adventure series ‘Saber Of London’, which if you ever wonder what the actor, Donald Gray, was like who did the voice of Colonel White in the original ‘Captain Scarlet’ TV series, then this is the best opportunity, especially as I found its now on DVD. You get anything from two to four pages an entry, covering the series, the vehicle and more importantly, what happened to it afterwards. Although I wouldn’t classify the book as being comprehensive, there is certainly a wide coverage and often some more unusual photos than you would normally expect. As with all such books, you always want more. There’s the odd mistake that should have been picked up upon. KITT’s hood sensor in ‘Knight Rider’ has more to do the Cylons in the original ‘Battlestar: Galactica’ than ‘2001: A Space Odyssey’. Even its interior voice box has nothing to do with the HAL 9000. Where ‘The Persuaders’ is concerned and as the DVD boxset testifies, it was only seen as a single series not four series because Roger Moore was already lined up to play James Bond. We’ll have to put this book’s release date as being earlier that ‘The Professionals’ being shown again on digital in recent years. All minor points really. Chapman does fill you in with all kinds of info about these cars, especially where they are today. Many of them can be found in the Cars Of The Stars Musuem in Keswick, Cumbria in the UK if you’re ever up that way. According to the Net, check its opening times before visiting. I found it fascinating how some of the more ordinary cars from the police/adventure series are cherished by fans. It’s also weird seeing the reaction from some car manufacturers to the popularity of the cars used in series. Some react with distain, some adopted the colour schemes yet none jumped on the bandwagon and produced duplicates where you would have been assured that there would have been a ready line of fan customers. Funny world, isn’t it? If you’ve collected other media car books and missed this one, then you’ll be happy to add this one to your collection. « Doctor Who: Black And White by Matt Fitton (audio-book review).